Stoppers stopped stopping? Follow these tips. Brakes not powerful enough? Levers spongy like cheese strings? Don’t buy new ones before you try these tips about essential disc brake maintenance. Struggling for power or modulation? Start searching for the solution here. Line up the blades so you’re just using one finger, pulling near the end of the lever. You’ll have the most power this way, and also the most control. While you’re at it, use the reach adjustment to bring the blade into the bar, close enough to get maximum power but not so close that it closes on your hand. If your brakes have any contact-point adjustment, dial it so there’s just a little ‘float’ before the pads bite. The most expensive fix, but upsizing can make a dramatic difference if your bike comes with piddly little 160mm rotors. Bikes often get fitted with a smaller rotor at the rear and a larger one at the front, which makes no sense to us. 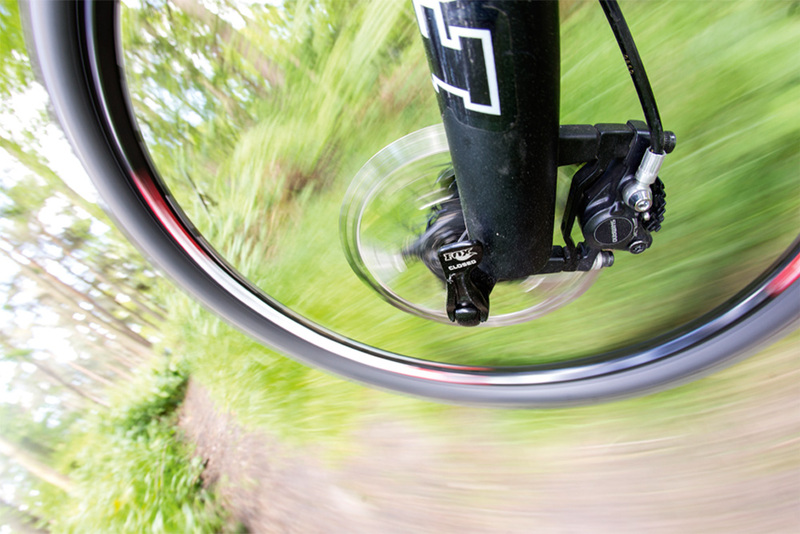 A more powerful brake on the front wheel, on steep, slippery terrain — no thanks! Upsize your rotors so they match and buy a caliper adapter too. Whip the wheels out of the bike, remove the pads and inspect the rotors and pads for grime or damage. If the rotors are straight and the pads have plenty of material left, clean them up with a fresh rag and solvent. If they don’t bite properly after this clean up they’re probably contaminated with chain lube, Miracle shine, silicone spray or something like it. Don’t try and salvage them — they need to be replaced. Organic (AKA resin) pads offer the most power in dry conditions, but wear out more quickly than sintered metal pads. The latter are also better in wet conditions but have an unfortunate tendency to squeal. You takes yer choice and all that. Now you should polish up your technique, as this is the best way to maximise your braking. Read about Fabien Barel’s braking tips here, and watch Brendan Fairclough reveal his secrets above. Something of a last resort but getting rid of OTT flappy hosing improves your bike’s look if nothing else! Seriously though, brakes are simple in operation: squeezing the lever pushes fluid along a hose to the caliper where pistons force the pads against a steel rotor. Some of this hydraulic power can be lost through the hose, which expands a little under the pressure. Keep yours as short as possible by cutting away any excess length. The concept is the same on all brakes — detach the hose from the lever end, remove the barb or olive that holds it into the lever body, shorten it with a cable cutter and thread it back together.